Ihave been using revision stations for a few years now in one way or another. Revision stations are a way to structure learning that allows a student to rotate to different locations and/or activities that each serve a different purpose. Revision stations are fantastic for a number of reasons. They are..
Of the list above, I think there are a few here worth mentioning in a bigger way. For one, revision stations in a 1:1 classroom help combat the “they just sit there looking at the screen” argument. Revision stations, even in a 1:1 classroom, encourage students to get up and move. Each station, you see, is in a different location of the room. Could students participate by not moving around the room? Well, sure. But why? They need to move. My latest book, Just Ask Us: Kids Speak Out on Student Engagement (Corwin/AMLE), shares the results of my nationwide survey of 6th – 12th graders and what engages them as learners. According to the initial survey conducted in 2015, students are asking to be able to move around in order to embed information. Revision stations gives them a structured and targeted reason to do just that, even in a 1:1 classroom. Now, I’m a writing teacher. So the Google Slideshow I’ve provided below, and the corresponding description of each station’s activity, focus on improving a rough draft. But think beyond this example. How can you use Revision Stations in a science classroom? Maybe each station points to a different way to test a hypothesis or prototype. What stations could you use? How might you use them in a history classroom? Perhaps stations could be used to think about different points of view. What other stations could you develop? 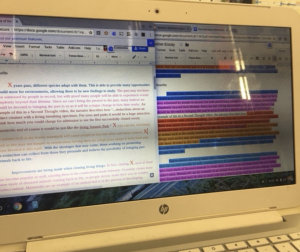 Station #1 – The author color codes their own essay using a key and develops a question for specific feedback from a peer. 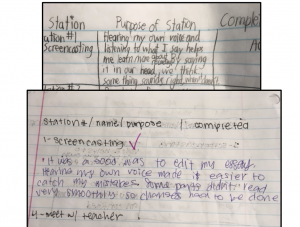 Station #2: Screencasting – The author records a screencast reading their own essay then listens and watches it themselves. Through speaking and listening, the students can catch a few of their own errors or make revision changes without my having to advise them. My students use Screencastify to do this easily on their Chromebooks. Review Station, students share a clean copy of their essays with a partner (not the one with the color coding on it.) 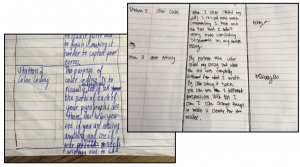 The peer then color codes the essay himself and answers targeted questions that help the author analyze what’s working and what isn’t about the essay. Note: By having both the author and the peer color code the essay, the author can then do a more side-by- side comparison of what the reader comprehends (see picture). This makes essay structure more visible. For instance, if the author has highlighted the textual evidence in orange, but the peer doesn’t have that in their color coded version, perhaps the author thinks their evidence is clear when it really isn’t. 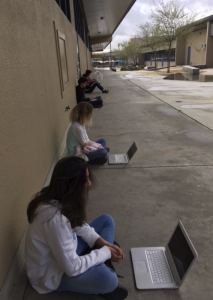 Station #4:Todaysmeet (Twitter) – This is where I have students ask questions about the writing process for other students to see and respond to on a public Todaysmeet feed. I don’t need to respond if other students know the answer. Station #5: Ask the Teacher – This is your typical 1:1 meeting with the teacher. They come to me with one specific question about their draft. It can’t be “read this and tell me if it’s good.” It has to show more knowledge about what they want to work on, something like: “I’m struggling with this thesis statement. Can you read it and see if it’s setting up my paragraphs clearly?” I only read what they are asking specifically about. 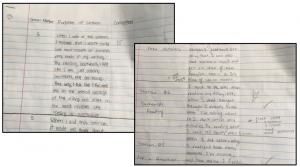 Station #6: Backwards Reading – This is a fun strategy that my students use when trying to catch more editing errors. Backwards reading, sentence-by-sentence, can help them find those piddly little mistakes like usage, punctuation, and spelling. Note: Many teachers use the term “Revision” and “Editing” exchangeably. But there are key differences and one should use targeted strategies to guide students in both. Revision = bigger changes to the essay: Kelly Galaghar, author and educator, uses R.A.D.A.R. to designate possible revision changes to make. Replace, Add, Delete, and Reorder. Interested in checking out my Google Slideshow for Digital Revision Stations? Check out this link , make a copy, and enjoy!